Thirty riders plan to clip-in tomorrow, a new high for this event. Wow!! I'll be at the Pancake Farm for breakfast and then available to begin registration and inspections by 6:30. A Rider's Meeting will be held at 6:55 and then you'll be on your way to enjoy the beauty of Lancaster County. I'll have a limited number of cue sheet copies at the start, so please try to remember to bring your own. Lights and reflective gear are strongly encouraged, even if only to assure a daylight finish (Murphy's law). I look forward to see you all tomorrow morning. It looks to be a great day. Four of us rode the Spring Forward course yesterday (2/26). Our goal was to perform a final check of the cue sheet, discuss "the plan" for next weekend, and bag our March 200k so we'd be free to help and encourage all the rest of you next weekend. We succeeded on all fronts. 1. Breakfast at the Pancake Farm is a good way to start the day. Moo. 2. The cue sheet is in very good shape. Draft 8 has been posted on the website. It is the final, official version. The mileages are spot-on. Some road signs continue to make unexpected reappearances/disappearances. 3. The course is as scenic as ever. Be sure to look around while you're riding. The ridge top vistas are superb. 4. Be on the lookout for unexpected scenery. We happened across a large gathering of snow geese early on. We now know what a gaggle looks like. 5. It is springtime in Pennsylvania, so you should anticipate the presence of sand/gravel at the most inconvenient places on course, particularly if you're pushing the limits. This is especially true for the 5 or so miles immediately after the Conestoga controle. 6. I noted a fair number of potholes. Some may not not always immediately visible due to shadows, water on the road, etc. Bonus points to riders who can locate a rather obvious heart-shaped pothole on course, assuming it is not repaired this week. A few photos taken by George Metzler during the pre-ride are here. Not to be outdone, Rick Carpenter's pictures are here. 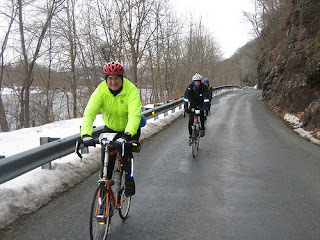 Anyone who has not yet handled their PA Randonneurs 2011 membership should bring their completed paperwork to the start or send it to Tom early this week (2/28). We're all looking forward to seeing you next Saturday! Andrew & the Spring Forward Organizers! We will be heading west for the next R12 event, the March 5 running of the Spring Forward 200k. I completed a pre- Pre-Ride this past Friday. Several road signs disappeared over the winter so I'll be updating the cue with a few additional spotting cues for anyone new to the course. Hopefully the updated cue will be available by March 1. For those of you familiar with the area, the route is unchanged from 2010. There is some new scenery (see above) and roads are in generally good shape. Barring any significant snowfall between now and then, I can report that a majority of the snowpack melted on Friday so we should have nice road conditions. There were times during my ride that I wondered if perhaps a canoe might have been a better vehicular choice. As always for this time of the year, you can expect to find traces of gravel & sand in the turns, so don't outpace your guardian angel. We are upping our game a bit this year and hope to staff a few of the controles so that weary randonneurs can be greeted by a friendly and familiar face (not that any of our convenience store clerks aren't). And I'm happy to announce everyone's favorite 95 mile controle at the house of George "Mr. 412" Metzler remains in the controle lineup. Definitely worth the ride. So stay tuned for updates and drop me a line if you're planning to ride. Ixsa Golliur writes "...Hope all went well with the ride yesterday. Bill (Reagan) and I were a bit sad we were not able to participate. I was wondering if this ride is available as a permanent or a post-ride(if there is such a thing)? Tom Rosenbauer responds " -- No, unfortunately there is no such thing as a "post-ride make-up", but if anyone is interested in adopting the revised "Beyond Hope to New Hope" course as a permanent, it's up for grabs. In lieu of the Riegelsville controles I had considered changing the route slightly but in the end decided to keep the course pretty much as is, as some may want to use it as a tool to measure their fitness throughout the year. Hopefully I'll get these new controles set tommorow and submit the Permanent Application over the weekend. Since this route is already approved as a brevet, I anticipate a fairly quick approval turnaround from Christa. Thanks again Tom for doing all of the upfront work. The cuesheet has been updated (draft 5 dated 2/8/11), with a minor route tweak to the first controle stop in Johnsonburg. The cell phone numbers for volunteers Don Jagel and Bill Olsen were also added. Don will be out sweeping the course towards the end, and Bill will be at the finish controle. - A couple areas of the course are a bit narrow and have potholes (e.g. Rt 32) -- this will be especially hazardous if you're traveling in large, fast paceline. It looks like the weather at least will be dry, and trending warmer as we head into the weekend. However, there is still plenty of snow on the ground which will be melting during the day and freezing overnight, so be on the watch for any black ice. The forecast is also calling for some breezy conditions. There is plenty of parking at the Belvidere diner start/finish. But please keep to the area to the left as you pull into the parking lot (away from the spots near the building). Please drop me a note if you decide to join us on the 12th. Due to black ice conditions and a weather forecast calling for snow/sleet/rain starting Friday night and continuing through Saturday, the event has been postponed for one week and rescheduled for Feb 12th.